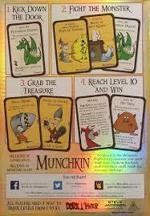 Munchkin has always been one of our biggest games. It struck a chord with gamers who liked the idea of some zany, back-stabbing fun mixed with a general lampooning of fantasy RPG tropes. And why wouldn't it? It's a great mix of ideas and mechanics. Munchkin did really well in the hobby, quickly outselling our other games and becoming a force to be reckoned with in the industry. When Munchkin started getting into stores like Target and Walmart, it was huge for us. It was the culmination of a lot of work and effort, and it was finally paying off. It's paying off for you, the fans, too, because Munchkin selling in these outlets means Munchkin in front of even more people. It means a wider group for you guys to play with, and it means we get the flexibility to make even more games -- both Munchkin and other games -- for you to enjoy! But something occurred to us when Munchkin started going mainstream: what if potential new Munchkin fans saw the box and had no idea what was inside? Or, worse yet, what if they just completely overlooked the box because of all the other shiny stuff in the same aisle? We had to address that potential problem somehow. 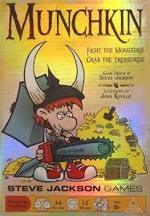 The answer wasn't to redesign the game; Munchkin's a great game, and there's a good reason why it's popular. To take a different direction from that would be a huge mistake, so we focused on something we could change -- the box -- without being unfair to our existing fans. The first problem was, "What if someone sees this box, picks it up, and has no idea what it is? What if they just put it down and don't take it home to try out?" We tackled this with a new approach to the back of the box. Instead of talking about the game with words, we used pictures, creating a comic panel-style approach that breaks down the action of the game into four simple steps, complete with big, pretty pictures of some of our cards so that potential players could see the punny names paired with the goofy art. We went through several iterations, but I think the final result does a good job of being both informative and entertaining, and it conveys what it needs to in a really quick and grabby manner. Problem number two was that we needed to make the box stand out, lest it blend in with all the rest of the boxes on the shelf. So we thought, "Well, why don't we make it shiny? People like shiny stuff, right?" This, too, went through a few revisions; we had to get the shininess just right, after all. And now it's out there! It's in a bunch of big stores, and if you go pick it up at Walmart right now, you'll even get an exclusive bookmark!